Email marketing tends to be a hit and miss sport. The right campaigns do everything you need and the wrong ones don’t even get a bat of the eye. We live in a day and age where the standard inbox is filled with hundreds of campaigns, most of which will never get the joy of even being marked as ‘open.’ So how do you make you campaign standout in an inbox? People are unlikely to open emails from a source they don’t recognise. With all the dangers the internet poses, opening emails from unknown sources is a very real modern day threat to devices, one that people are well aware of. To make the reader more comfortable with the email ensure that it is from a source that they will recognise. This may be either your business name or even your personal email address with which they’ve had previous correspondence. Your sender name needs to be from a source that the reader not only trusts but is expecting an email from. If they haven’t opted-in to receiving an email campaign from you it is likely that you’ll sooner end up flagged as spam. 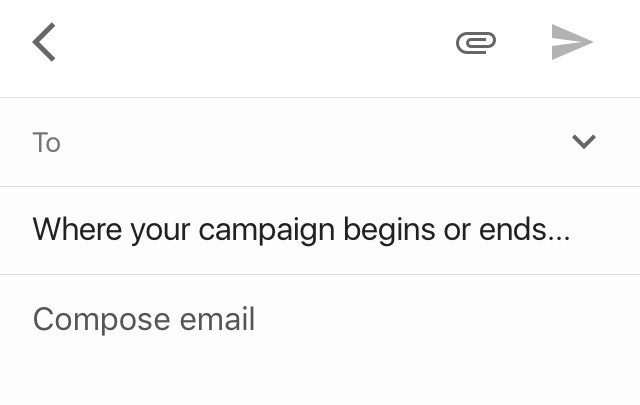 The negative reputation that comes with this is unnecessary and best avoided by making sure your list knows in advance to expect emails from you. The importance of the subject line shouldn’t be neglected. It can make or break your campaign before it’s even seen the day of light. Firstly, you should ensure that everyone is able to see the subject line as intended. Ensure that is is suitable for a mobile screen as well as a computer screen. This has become even more important in recent years, as now approximately 50% of emails are viewed from smartphones. Personalisation is an added touch to every subject line that is likely to raise your chance of your email being noticed. The best subject lines are able to draw the attention of the reader and play on their psyche. They range from funny to clever. In order to drive up that open rate, the subject line needs to create a need in the reader’s’ mind that can only be addressed through opening up the email. A need to know- the subject line could provide a snippet of information enticing the reader to take a look at the full text that awaits them in the body of the email. A need to be included- people don’t often enjoy being left out of trends, from fashion to gaming, people like to keep in touch with what’s current. Let them know that you can help them do just that. A need to make their life easier- everybody wants to be able to do stuff quickly and at a low cost to themselves. If your subject line suggests to them that they might be able to do this, you’ve got yourself a winner. The most well received subject lines tend to the ones that are honest. It may not always drive up your open rate but it can certainly establish a good reputation for your business. Needless to say, sales are not the only thing that can be obtained from a successful email marketing campaign. The use of emojis in the subject line is a growing and successful trend. Things to remember when doing this are not to overuse emojis, make sure that the emojis don’t trigger spam filters, and make sure the emoji is visible on every device. Often seen as the transition between the subject line to body of email, the pre-header text is another opportunity to engage your reader with your content. It can be created so that it differs to the actual text within the email and not visible inside the email once opened. The pre-header text in an email can work very similarly to the subject line and is perhaps best used if it conveys the same theme as the subject. It does not stand out as boldly, but there is room to write more in the pre-header text. It can be used either to begin conveying the message your email holds, providing a teaser, or it can be used again to entice the reader into opening the email by using promotional and catchy lines. For an e-commerce business the pre-header text presents the perfect opportunity to make a call to action, encouraging the readers to buy their products. The pre-header text presents an opportunity to be personalised. It can be designed to include the name or information regarding the target audience that further increases the chance of it being opened. If used correctly, the pre-header text can tie together your subject, the body of your email and the message that you are trying to convey.